I'm just happy to get photos of Paris, whatever or wherever they may be! I appreciate the effort and time you put into this and I look forward to it each day. Thank you! They all appear to be missing one arm, as well! And, there do seem to be a lot of clothes inside which could have warmed up their poor naked mannequin bodies. Its a sort of sad photo, but I like it for that. They're trapped behind a grate in a very grey frame. They should have called the place Not-so-Brighton. And what's up with that one with his back to the window?! What Sandy said! And, Carrie, It seems to me they have to remove one arm in order to dress the mannequins (then they put it back on through the sleeve). Ditto Alexa and Sandy! You transport us daily, Eric, and we love it!! Oh, your mannequin photos are very popular -- I have one hanging on the wall in my studio. Maybe they are practicing to become cemetery statues, yeah? lol. I think all the PDP'ers are satisfied witk whatever you dig out. I have a second home in Brighton. I started staying with this family as an exchange student when I was 14 Y.O. and I still go there and they are like family to me. So I like Brighton very much. I think the men disturbed my spelling. I like you can't live without your camera, the same than me, my friend. There is also a Hotel Brighton on the Rue du Rivoli which according to its website gets its name from the cordial relationship (really?) between Britain and France during the reign of Queen Victoria. So a link to Paris there. More recently, Brighton has become noted for its thriving gay community which could explain the shop display, or not, as the case may be. Fabulous French Blue; I wish my whole house were that color! You're on a naked kick, aren't you, Eric? lol I used to work in a clothing store and had to "dress" the window (no mannequins though) and I always thought it was the most fun part of the job. A creative challenge to coordinate the whole window display with a theme or a color -- such fun! Isn't there another manniquin shop on rue Reamur, just west of rue de Turbigo? I passed it going to the rue Volta apartment from the Reamur-Sebastopol Metro. And BTW, in the Musée Carnavalet there is a painting of the building that now is the Monoprix at Reamur/Sebastopol. Let me find it...ah! "La queue à la porte d'une épicerie, novembre 1870" by alfred DeCaen & Jacques Guiaud. Apparently, the Monoprix building was an épicerie even in 1870. So, your photos are very Impressionistic in subject. On your way to LeRoy Merlin for the paint, Eric?!? I LOVE that place! And I love this photo also...stark, poignant...always interesting. Thanks for all you do for our days, Eric! I love the silver and gold and the symmetry of the two gridded windows. It is a clever display, subtle, yet in your face attention-getting at the same time. Cool image! 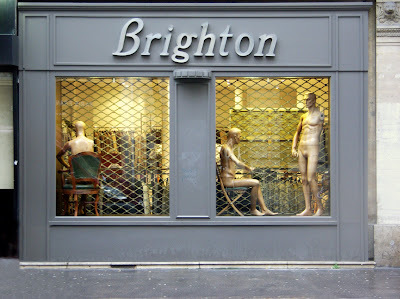 Brighton is a well known fashion accessories boutique chain in the United States.